Opening Night Kick-off Concert! Premiering "Exceedingly" - written by Rodney Griffin of Greater Vision, arranged for banjo, piano, bass, cello, triple fiddles and vocal trio by Abigail! Love our backdrop! How fitting for an election year. Piano Quartet - 40 fingers on 80 keys! While rehearsing this audience favorite, one of the piano benches they were using collapsed without warning! Thankfully we were able to borrow a wooden bench for the concert. A dramatic presentation of the Family Camp theme - "Now is the time. Let your light so shine!" Special tribute to the outgoing president. Col. and Mrs. T - you will be missed! Stick Horse Rodeo buckaroos! The HUNDREDS of kids that participated in the rodeo rode their ponies hard delivering Pony Express Mail, barrel racing, and more. A young Indian makes his way to the rendezvous. Rachel Kane, the gorgeous 2016 Rodeo Queen! She was paraded around the arena to the strains of Yellow Rose of Texas, courtesy of the musical entertainment - us! 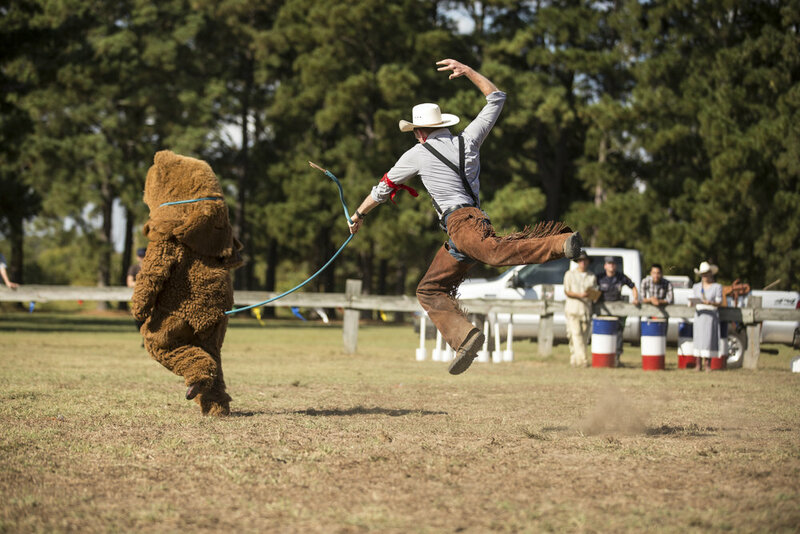 The ongoing comedic play between rodeo events. Dr. Lew Sterrett from Sermon on the "Mount" with Handsome the horse! Gotta love Luke's expression...."are you sure about this tempo"? We performed as part of Community Night with Dr. Lew Sterrett. Giving a concert outdoors is always challenging due to the unpredictable weather, but this one was doubly so! First a rain shower rolled in during set-up, necessitating a hurried re-packing of the sound system and instruments in the van, then the humidity descended upon us so heavily, there were drops of water sitting upon our instruments and equipment. Afterward we arrived back at our accommodations, we set the electronic equipment and instruments out to dry overnight! Photo booth "Wait for it..."
Silas in the bow of his and Laura's canoe - capturing second place for their canoe race! Assisting with the compilation of the Biblical books of John and Romans in the Tamil language for distribution overseas! Each booklet is read by approximately 20 people! Can you spot the Karen? Post your answer in the comments! She's watching from the sidelines during a fascinating protection dog demonstration by Dunetos K-9! Dunetos K-9 provides service, protection, and tactical dogs. They demonstrated many different skills including search and rescue, dog/handler training techniques, and protection/attack scenarios (pictured). Special thanks to Maj. and Mrs. H for their coodination of the week! Special thanks to the a/v crew for your work throughout the week. Well that's it for Texas, folks! Hope to see you in person at one of our concerts this year. Special announcement coming tomorrow!